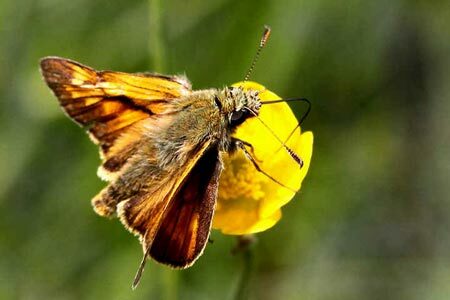 Special features: At rest, the large skipper assumes a moth-like stance, with its forewings and hind wings held apart at different angles. The males, like the one above, have a black line running diagonally through their forewing. In the females this is absent. The rest of the wings have a mottled appearance. The males are at their most active in mid-morning when they patrol their territories in search of a female. Distribution: Found in England, Wales and southern Scotland. Habitat: Rough grassland and woodlands.